RedBear CC3200 Wi-Fi Board is an effective Wifi tool to speed up your IoT projects. The Arduino board supports a lot of different projects.These projects however need to have an effective internet connectivity with a wireless network. 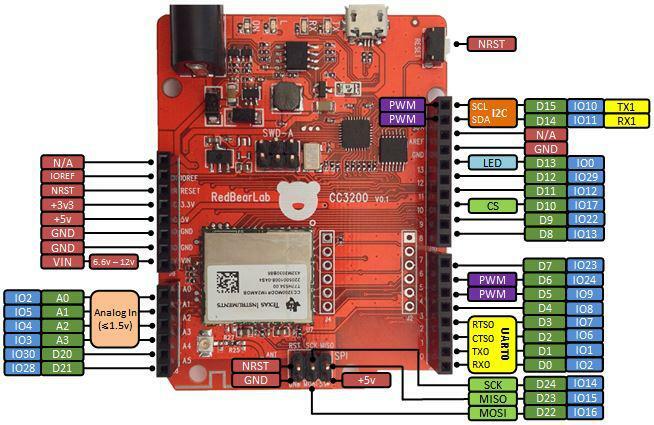 RedBearLab CC3200 WiFi board, is based on CC3200 module that is provided by Texas Instruments (TI). The target MCU is TI CC3200, the industry’s ﬁrst single-chip ARM Cortext-M4 core microcontroller unit (MCU) with built-in WiFi connectivity. With on-chip WiFi, Internet, and robust security protocols, no prior WiFi experience is required for faster development. It is oﬀered to make you quickly produce prototypes and demos target for not only Internet of Things (IoT) but also many other exciting and interesting projects, such as WiFi Camera, WiFi Audio, TFTP Client, TCP/IP or UDP Server/Client, Http Server, XMPP Client, mDNS, etc. Up to 27 individually programmable, multiplexed GPIO pins, including a fast parallel camera interface, I2S, SD/MMC, UART, SPI, I2C, and four-channel ADC. This product is designed by Redbear, For technical support, please visit https://redbear.cc/contact-us/.